Water Usage Comparison | Texland Petroleum, L.P.
To extract gas from the Barnett Shale, companies had to create their own extensive network of fractures by forcing upwards of 2 million gallons of water per well into the shale to provide enough pressure to effectively “crack” it open. By contrast, operators in Lubbock do not have to use nearly the volume of water to crack open pathways in rocks. For a horizontal Clear Fork well, Texland uses a total of 60,000 gallons of fluid in a typical frac job, being 40,000 gallons of produced crude oil and only 20,000 gallons of water. Hydraulic fracturing in the Clear Fork uses about 2% of the total fluids and 1% of the water used in the Barnett Shale. A 2011 survey by the Texas Water Development Board shows that all “mining” related activities, including oil and gas drilling, constitute a total of 0.8% of the total water usage in Lubbock County. 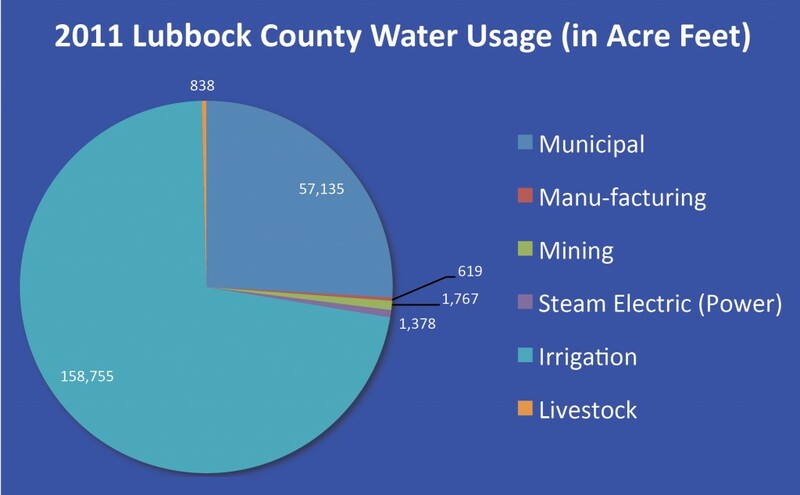 The largest water user by far is the agriculture industry, accounting for 72% of all surface water and groundwater usage in the county.